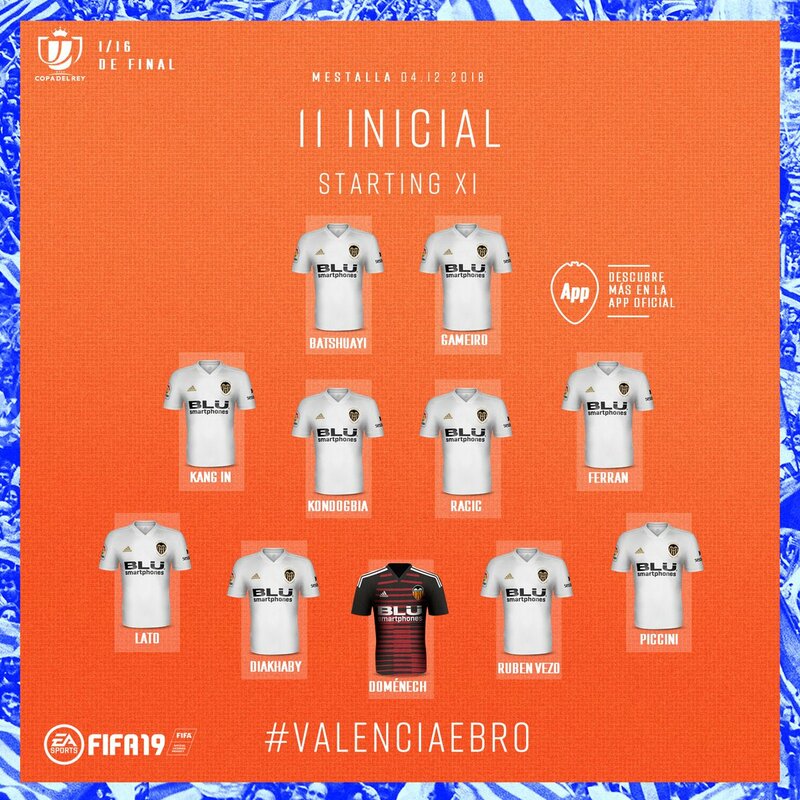 In the first leg of this round, Valencia scraped a narrow win against a third level side, yet another of many numerous unacceptable performances this season. Tonight offers the team the chance to score an easy win, for out of form forwards like Batshuayi and Gameiro to get some goals and for some of the lesser used or B-team players to try to impress. with only Gameiro continuing from last game. Racic gets his first start in a competitive game. Hopefully the team can secure a morale boosting win. Assuming I can get a stream I'll try and update this later, but if not feel free to comment here in the meantime. Got a stream and wish I hadn't as it was the same old rubbish. If the team had been playing well in general we could have at least written it off as the second string but I'm bored with making excuses. Ebro, a team struggling at the third level, made us look very ordinary at the Mestalla. It was an even first half with Kondogbia coming closest to scoring for us and one of their players almost scoring with a strong shot from distance of the type that we barely ever see our players hit. It took until the 58th minute for Batshuayi to break the deadlock, heading home a good cross from Lato. Bats didn't smile and I think few Valencia fans did either. Jaume made a couple of good reflex saves. Defence had little to do. Kondogbia had his moments, especially in the first half, but lost the ball too much and is way short of last year's level. Racic looks a handy back up. Ferran didn't do a lot apart from a decent moment of skill near the end. Kangin had a good game and worked hard. Bats despite the goal offered little, losing or delaying on the ball too much. Gameiro was awful, think he didn't touch the ball until the 25th minute and when he went off with a knee injury I don't think many cared unfortunately. Parejo came on to boos. An in-form Sevilla next and failure to get 3 points and we can definitely kiss any top four dreams goodbye, though they already look a distant fantasy.